Many users worldwide have reported about Windows update error 0x80070020 issue that normally occurs while trying to get access to the Windows update. In this perilous circumstance, when you start downloading the updates, it stops after few moments and shows 0x80070020 error message. Additionally, you also get this pop-up while trying to upgrade the Windows OS to Win 10 from the earlier ones. Sometimes, you successfully install the latest version of the OS but later on, it is rejected and PC rolls back to the previous state. In each instance of this annoying problem, you get error code preventing you from completing the task. Code 0x80070020 Windows Update encountered an unknown error. So far, it’s not quite sure what is the main cause behind the appearance of this bothersome error messages. However, the most likely could be low system memory, vicious software, corrupt Windows registries, malevolent system files, malware or virus and so on. A nasty malware silently penetrates the Windows devices by stealth and contributes numerous malicious activities inside. 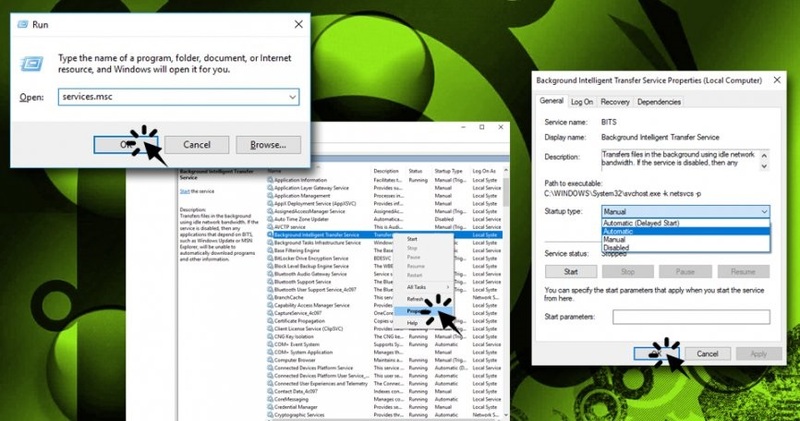 It ruins vital system files that are essential for smooth computer processing and prevents many installed apps as well as drivers from working normally. It keeps performing evil acts all the time and causes several hazardous issues inside including Windows update error 0x80070020. 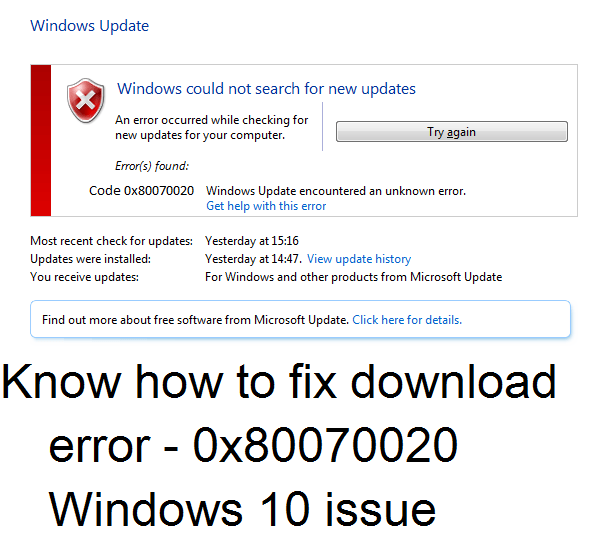 How To get Rid of download error – 0x80070020 Windows 10 Problem? Internet is full of forums where users are searching for proper solution to fix this annoying issue. If you are also encountering same dilemma, you don’t need to be panic. Here, we have provided some effective methods that you have to apply one at a time and then see if the problem still occurs. Press the ‘Windows’ key, type ‘troubleshoot’ and then tap on ‘troubleshoot’. 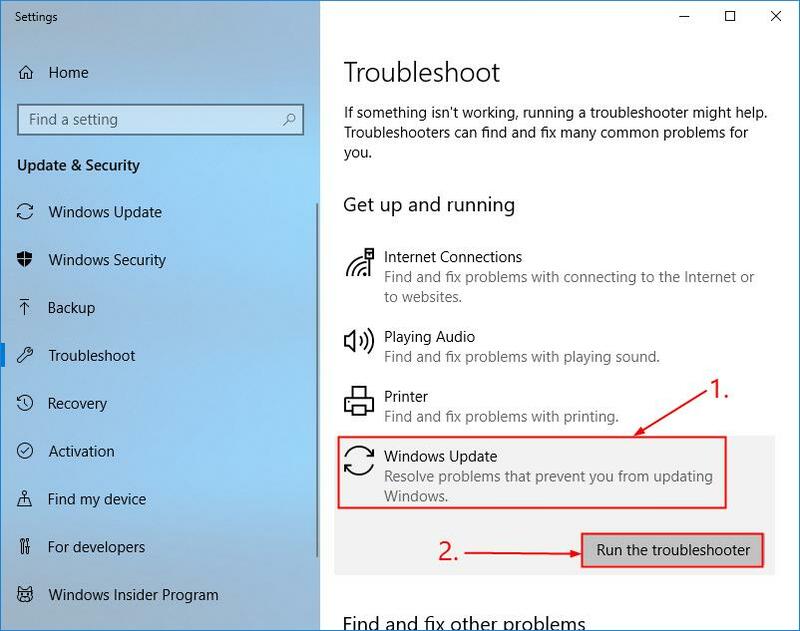 Now, tap on ‘Windows Update’ and then choose ‘Run the troubleshooter’. Go through the on-screen instruction to troubleshoot. Reboot your system and check for the solution. This hazardous dilemma might occur due to damaged system files. And hence, you should run the System File Checker to scan your PC and fix the issue. Press ‘Windows’ key and type ‘cmd’. 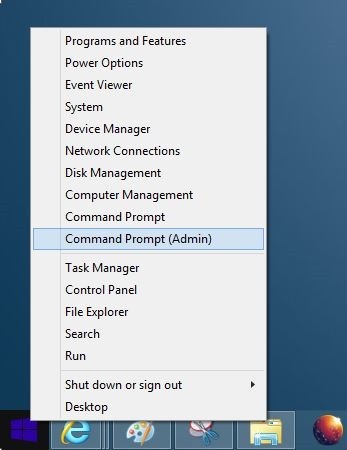 Right click on the ‘Command Prompt’ and choose ‘Run as administrator’. Tap on ‘Yes’ if UAC Window appears. 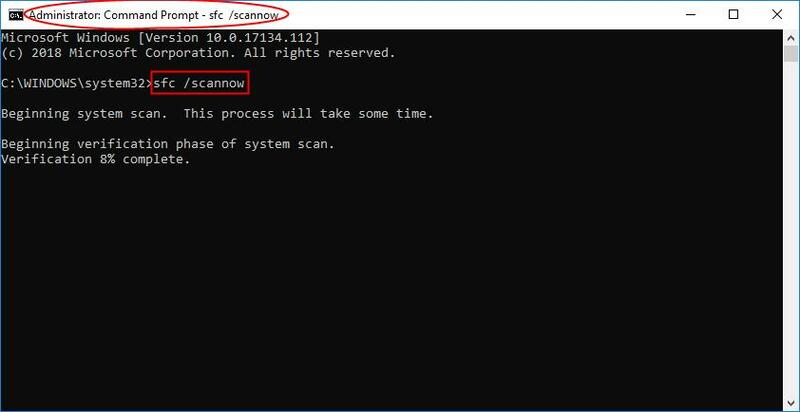 Now, type ‘sfc /scannow’ in the command prompt Window and then hit the ‘Enter’ button. Wait until the verification completes 100%. It may take few minutes to replace the corrupt system files with new ones if it discovers any. Restart your PC and check for the solution. Experts say, the 0x80070020 error is normally associated with the Background Intelligent Transfer Service (BITS) that delivers and arranges Windows updates. 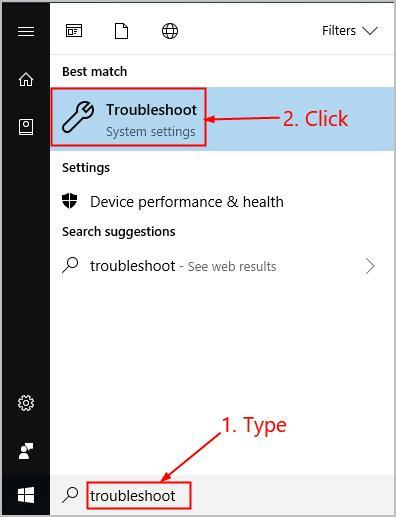 Any issue with the process may cause Windows 10, version 1803 – error 0x80070020 problem and therefore, you should restart BITS. Press ‘Windows’ key and ‘R’ at the same time and then click on ‘OK’. Find the ‘Background Intelligent Transfer Service’ and right-click on it. Choose ‘Properties’ and open ‘General’ tab. Locate ‘Startup Type’ and choose ‘Automatic’. In case the BITS process is not running, right-click on it and opt for ‘Start’. Save the modifications and close Services Window. Once done, see if Windows update error 0x80070020 issue still occurs. 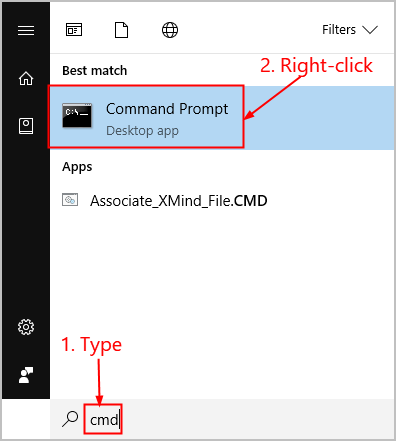 Press ‘Windows’ key and ‘X’ simultaneously and open ‘Command Prompt’ as an administrator. In the command prompt Window copy-paste the following commands one by one and hit ‘Enter’ after each. Once done, check for the solution. Third-party anti-virus tools may also cause such annoying problems as they conflict with Windows Update components. And thus, try uninstalling them to get rid of the threat. Press ‘Ctrl+ Shift + Esc’ at the same time and open ‘Task Manager’. 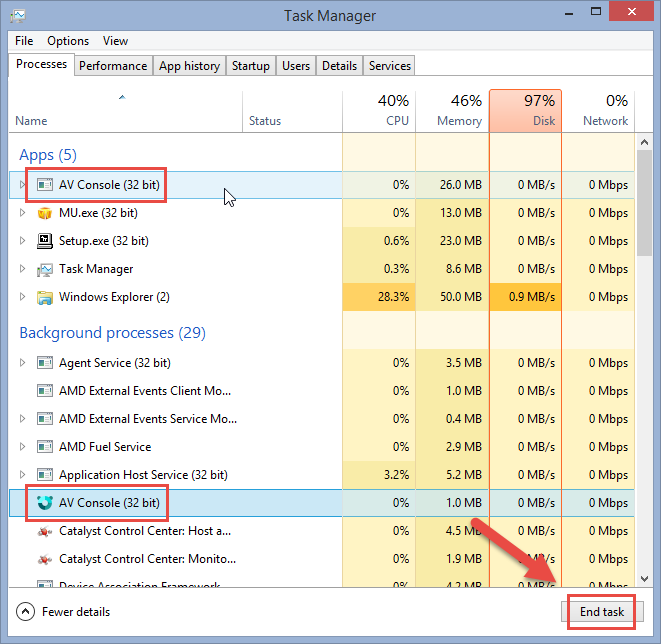 Find third-party security program and click on ‘End task’. Now in the search box, type ‘Apps & Features’. Chose anti-virus program from the list and tap on ‘Uninstall’. Restart the Computer and check for the solution. As we have stated before, the Windows update error 0x80070020 issue might occur due to the presence of malware or virus in the infected PC. So, you need to scan the complete device to remove all the perilous infections from the work-station. You can do this both manually as well as automatically. The “Manual” process requires much attention and you need to be highly skilled in computer or technology. So, we strongly recommend using “Automatic” procedure and for this purpose, you can use Reimage anti-malware software. All being well, one of these steps helped you in fixing “Windows update error 0x80070020” issue. If you really liked the article or you have any other solution to get rid of the problem, just let us know. Write us on the comment section if you have any question or query.